The irresistible handmade Double Delight pizza combines two of our top selling pizzas to create a masterpiece! A slim trim crust of Belgian milk chocolate with a topping of brownie biscuit, vanilla fudge and milk chocolate covered rice balls all finished with white and milk chocolate curls. 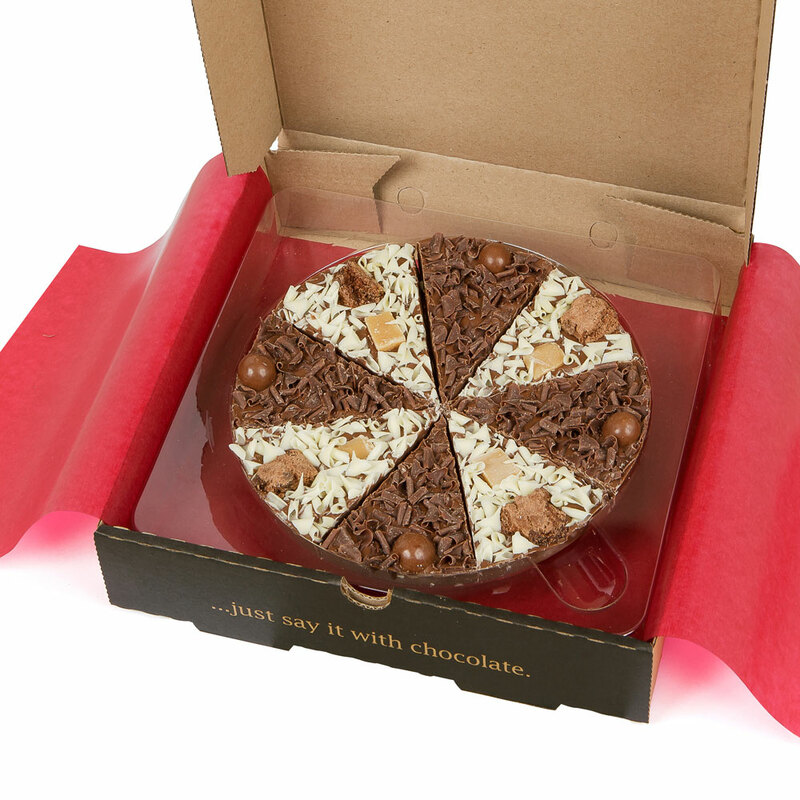 The chocolate pizza is hidden inside red tissue paper inside a real pizza box to surprise your unsuspecting gift recipient! The Gourmet Chocolate Pizza Company's team of talented chocolatiers make all their pizzas by hand in Nottingham, they are busy creating the most delicious, decadent, mouthwatering, fun chocolate gifts.....ever ! Shelf life: This pizza has a shelf life of 9 months. Milk Chocolate: (min 33.6% cocoa, 20.8% milk solids.) Sugar, cocoa butter, whole milk powder, cocoa mass, soya lecithin, milk sugar, whey (milk) powder, wheat flour, vegetable oil (palm, sunflower), glucose-fructose syrup, fat reduced cocoa powder, natural vanilla flavouring, vegetable fat (palm, coconut), vanilla extract, raising agents: E450 and E500, skimmed milk powder, lactose (milk), rice flour, malt (barley) extract, salt, egg protein powder, colour: caramel, natural flavour, shining agent(E414). This product contains milk, soya, wheat, egg and barley. This product is made in an environment that uses nuts & cannot be guaranteed to be trace free. 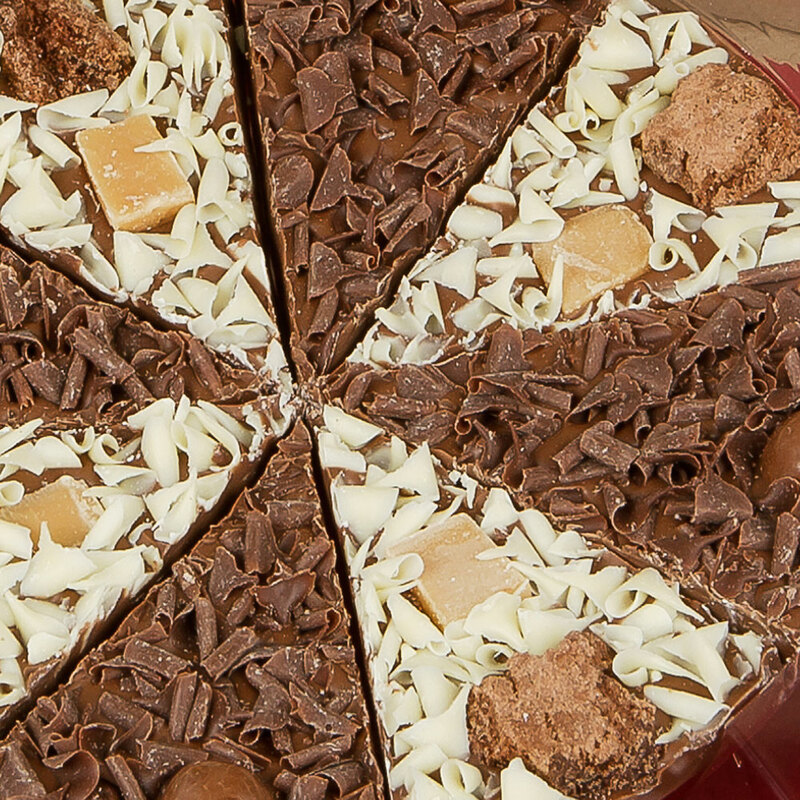 This product is dispatched by The Gourmet Chocolate Pizza Company. This item has a shipping weight of 500g.